Daniel Craig has committed to star in the psychological thriller "Dream House," marking Morgan Creek's first movie under the reign of Rick Nicita and its first production start in three years. Jim Sheridan will direct the film, which starts shooting Jan. 25. Craig plays a New York publishing exec who relocates his family to a small New England town, only to learn that their new home was the scene of a vicious murder. “Denny is very unpredictable, very explosive―and it ain’t all Mr. Nice Guy, that’s for sure,” Jackman says. Daniel ("007") Craig and Hugh ("Wolverine") Jackman are rehearsing for the soon-to-preview Broadway play "A Steady Rain," in a location a publicist describes as "top secret." Daniel Craig James Bond and the Boy From Oz are not regular visitors to the Cook County courthouse. But then, Thursday was an unusual day at 26th and California. Around noon, the movie stars Daniel Craig (the current Bond, left) and Hugh Jackman (a Broadway star and the most recent host of the Academy Awards, below) arrived at the Cook County Criminal Courts at 2600 S. California Ave., unannounced. Before long, deputies' hearts were a-twitter. "They came in, best we can tell, with everyone else and walked around pretty nondescript," said Cook County Sherriff's spokesman Steve Patterson, adding that the court was not told of their arrival in advance. The actors confirmed their identities when asked. 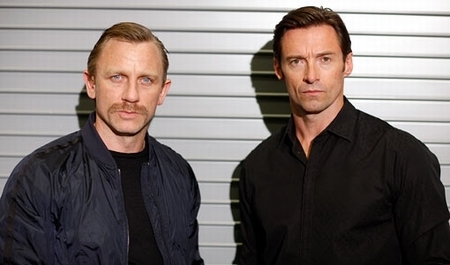 Craig (an Englishman) and Jackman (an Australian) are playing those police officers. In short, they were spending time scoping out Chicago cops in their natural habitats. According to a New York spokesman for the play, the visit to Chicago had been kept a closely guarded secret to allow the actors time and space to do the requisite research for their roles. It's no secret anymore. 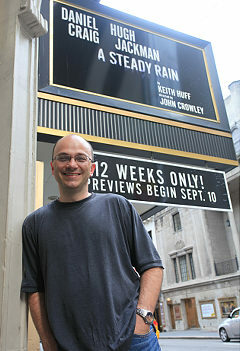 By late Thursday night, innumerable tweets had reported Jackman and Craig sightings at various iconic Chicago locales.